TIFF to PDF Converter is a simple, lightning-fast desktop utility program that lets you convert TIFF (photos, scans, drawings and faxes) into Acrobat PDF documents. You can merge several TIFF files into a single PDF file, or convert each TIFF file into a separate PDF file. You can control the output PDF size using compressions. Convert each TIFF file into a separate PDF file. 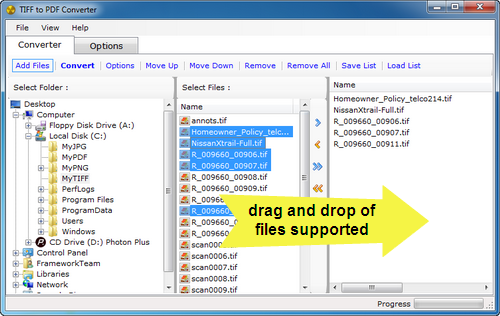 Supports virtually all TIFF compressions, including ZIP, LZW, Fax, Group4, RLE. Automates the process of TIFF to PDF Conversion.